X-ray diffraction is a standard technique to investigate pharmaceutical compounds and formulations, both in production and academic research. 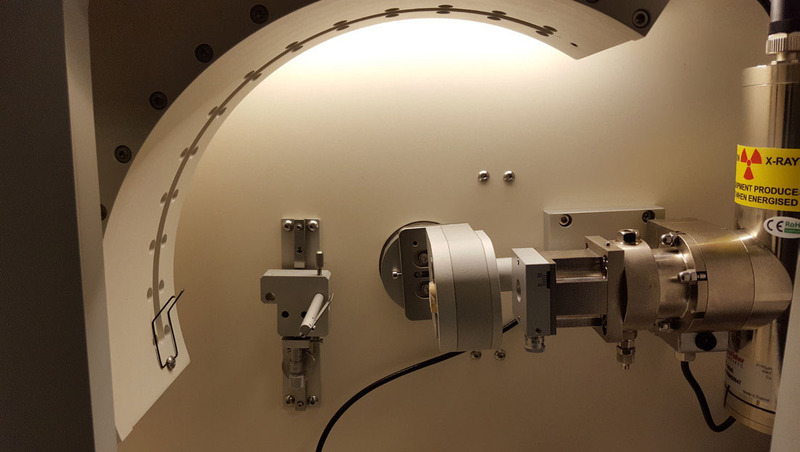 As the need for new drugs to better serve society increases, so does the demand for versatile X-Ray diffractometers to support pharmaceutical research. Active pharmaceutical ingredients (APIs) and other compounds must pass rigorous screening like salt formation, co-crystallization or polymorphism during research and production quality control. These steps can conveniently be achieved using powder X-ray diffraction thanks to the inherent sensitivity and ability to differentiate between different crystallographic structures. 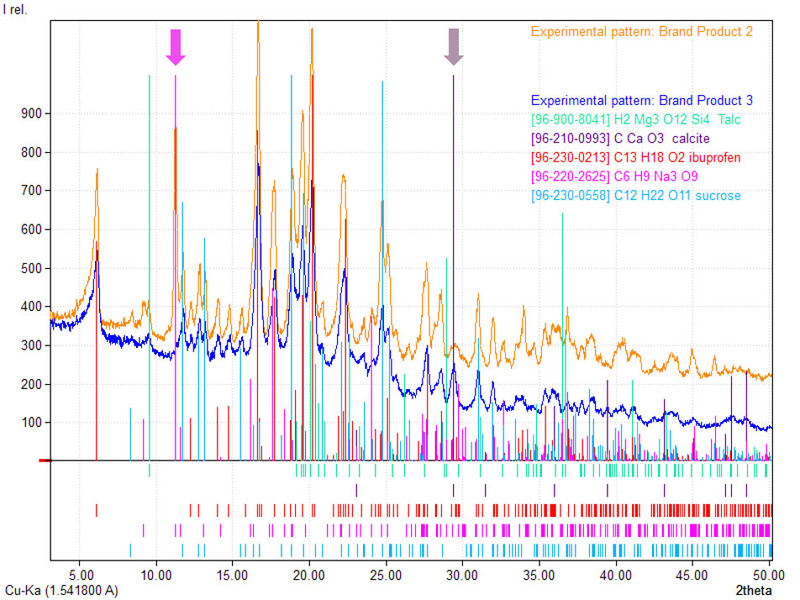 It is also possible to perform dynamic studies, follow the crystallization behavior of compounds in different solvents or non-ambient conditions. It is now even possible to routinely solve the crystal structure of new compounds from powder data. In addition, X-ray diffraction affords the ability to trace impurities during synthesis, thus improving processes. 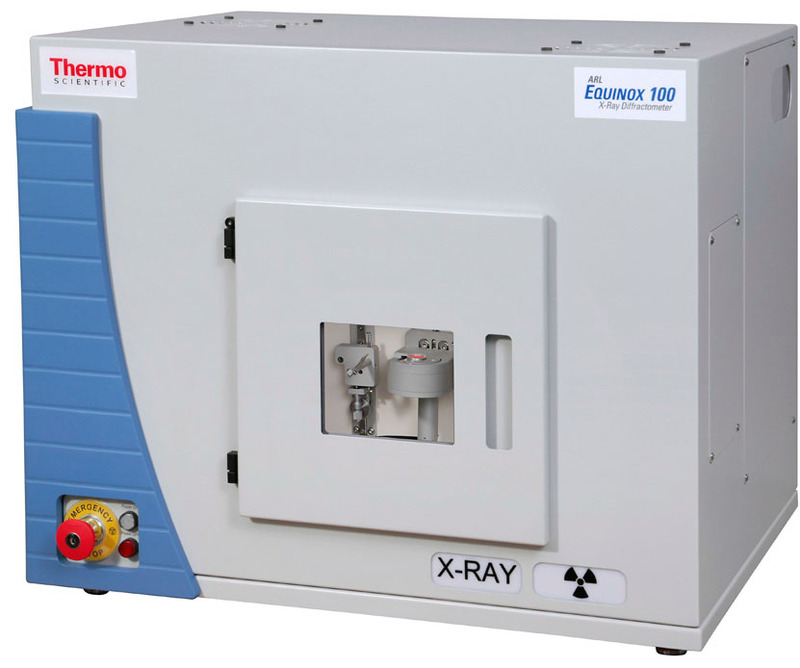 The Thermo Scientific™ ARL™ EQUINOX Series represent a portfolio of XRD instruments from simple, easy to use bench-top systems for routine analysis to more advanced floor-standing, high performance, research grade systems. The Thermo Scientific™ ARL™ EQUINOX 100 employs a custom-designed 50 W Cu or 15 W Co high-brilliance micro-focus tube with mirror optics which does not require an external water chiller. The unit can be transported between laboratories or into the field without requiring any special infrastructure. The ARL EQUINOX 100 provides very fast data collection compared to other diffractometers due to its unique curved position sensitive detector (CPS) that measures all diffraction peaks simultaneously and in real time. It is therefore well suited for transmission mode measurements (cf. Figure 1). Ibuprofen samples from four different vendors were ground and loaded into transmission measurement cups using scotch tape. 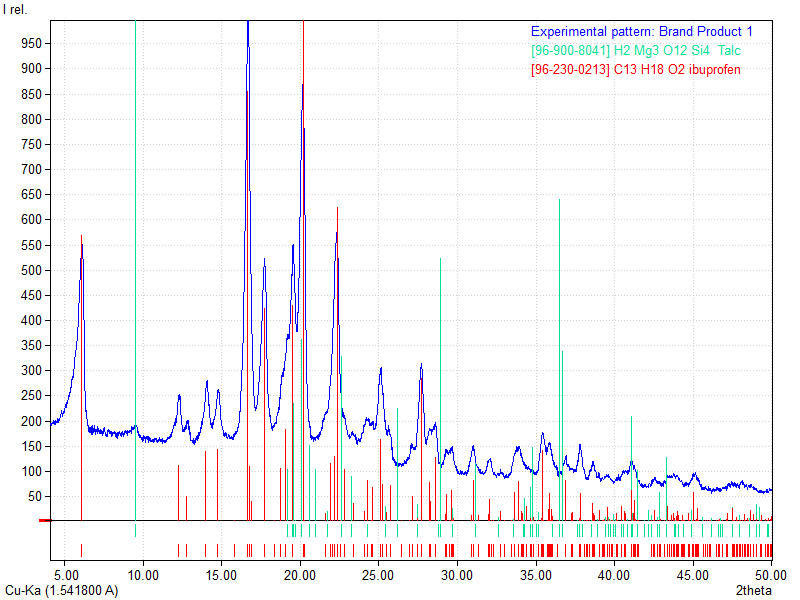 Each sample was rotated and measured for 10 minutes using Cu-Kα radiation (1.541874 Å). Data processing and evaluation was performed using MATCH! equipped with the COD database for qualitative phase analysis. Ibuprofen products (200 mg), both brand-name and generic, usually contain a variety of non-API compounds which tend to differ between vendors. Those include cellulose, pigment or filming agents. XRD is the ideal technique to clearly distinguish between crystalline phases in such mixtures. 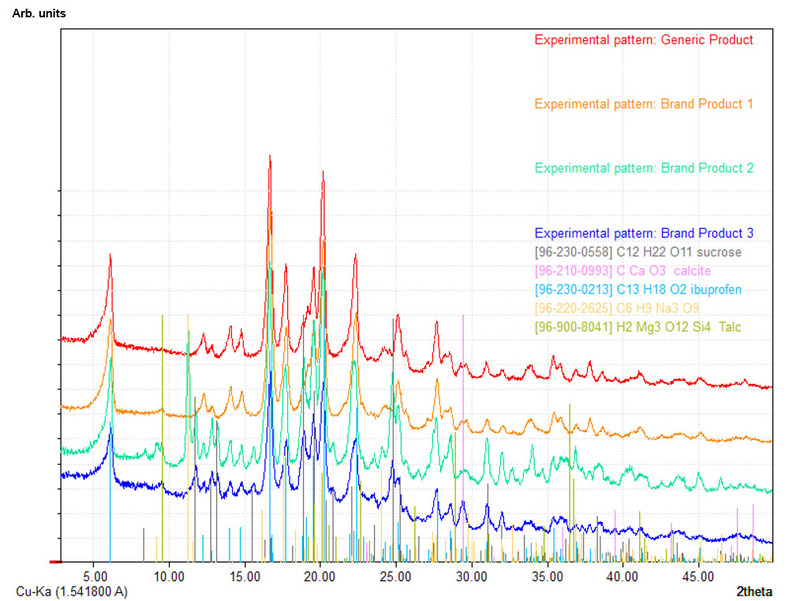 Presented below are four samples from different vendors showing different formulations (peak positions are indicated as vertical lines). Therefore the diffraction patterns of the different products exhibit differences which are clearly visible (cf. Figure 3). There are many generic products on the market whereof one was investigated and the only crystalline phase is Ibuprofen (cf. Figure 4). These results are also comparable to one brand product where only traces of talc (green, used as a lubricant) are detectable (cf. Figure 5). Except from these two examples there are vendors which use additives (additionally to talc) to accomplish different requirements (cf. Figure 6). In contrast to Brand Product 3, Brand Product 2 contains Sodium Citrate (purple) but no Calcite (grey) (arrows mark differences). Sodium Citrate and Calcium Carbonate are used as buffering agents to minimize the harm to the stomach caused by the Ibuprofen, whereas Sucrose (blue) yields a more pleasant taste. 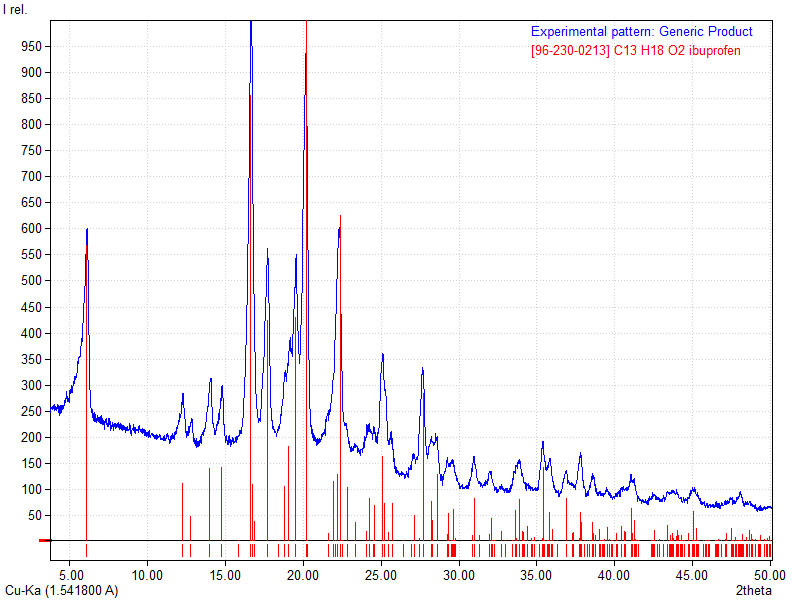 The good resolution of the ARL EQUINOX 100 in transmission mode geometry enables the ability to clearly resolve the crystalline phases in different pharmaceutical mixtures. A 10-minute measurement time is enough to perform a qualitative phase analysis and also detect trace phases. Hence the ARL EQUINOX 100 is an easy-to-use tool for all realms of pharmaceutical research or production from preformulation through to QA/QC of the final drug product.